The cat flap opened. Emily thought a wild animal was coming into the house. But the muddy creature that climbed through had four little wheels and a tail. It spoke in a voice like rough sandpaper. 'Come on, you two - it's nice and warm in here.' What if there exists a world powered by imagination? A world of silliness, where humans and their toys live on long after they've left the Hard World . . . and what if the door between that world and this one was broken? Welcome to the Land of Neverendings. 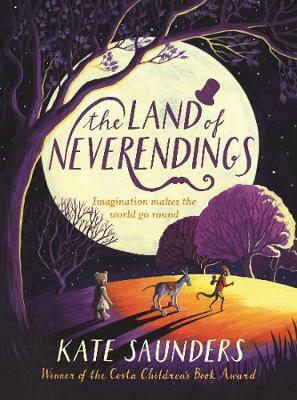 Moving, raw and funny in all the right ways, The Land of Neverendings is a rip-roaring adventure, but it also gives an honest portrayal of grief for young readers, and shows us that whilst sadness does exist in the world, it doesn't have to cancel out happiness, or silliness, even when you lose someone you love.